Chances are, if you’re a small business or non-profit, you’re doing some Facebook marketing. As the world’s most popular social media platform, it’s likely your audience spends some time there every day. But like many other marketers, you may be struggling with how to build a fan base, engage your audience, turn fans into customers, all while running your small business. If that’s the case, read on! This article will help you optimize your Facebook marketing so that you can build your business. 1. Create balance in your Facebook marketing. Marketing: This is what you do from your business page. Building a fan base, creating compelling content, and engaging your fans. Insights: Facebook provides some pretty cool feedback on the content you’re sharing…how often are you checking it out? 2. Create a compelling profile. Cover photo: Choose something that represents you or your personal brand. Sometimes I use a photo that shows me presenting, other times shots from my favorite ski mountain, Sugarloaf. (Maine is part of who I am.) Remember that every time you change your cover photo the update appears in your network’s newsfeed, increasing your visibility. About page: The more you share, the more likely you are to make connections with old friends and new acquaintances. Complete this section as completely as possible. Head on over to the Find Friend Browser and search for connections based on your hometown, current city, high school, mutual friends and more. Pro Tip: when reaching out to new contacts, always send a message along. Whether it’s an old college buddy or a friend of a friend who you want to connect with, a personal touch goes a long way towards getting a positive response. Like, comment on, & share friends’ activity: Spend a few minutes between phone calls or meetings in your Facebook newsfeed catching up on your friends’ activity. A like goes a long way, and a comment goes even farther. Chat friends up: A quick chat with a far away friend (or even a neighbor) can shore up weak ties of engagement. Your business page can’t do that. 5. Build a “home base” for your business. Choose the right cover photo: At 851 pixels wide by 315 pixels tall, your cover photo sets the stage for your brand. Just remember that you can’t have any calls to action, like “like us” or “visit our website” as part of that cover photo. Maximize your avatar: Facebook recommends you choose an image that’s 200 x 200, even though it’s resized down to 160 square on your business page. Keep in mind, though, that it shrinks down to 50 pixels square in the newsfeed, and only 32 square on updates and comments. In other words, use a simple image that is recognizable even at 32 pixels. Vanity URL: Make sure you have an address like http://www.facebook.com/flytenewmedia rather than a long string of numbers. It’s easier to share and it’s “purtier.” You can get your Facebook Vanity URL here. Custom tabs: I used to say that you really needed to focus on creating beautiful custom tabs to engage your page visitors, but Facebook is currently revamping custom tabs and may reduce them to text links, so hold off on any changes right now. 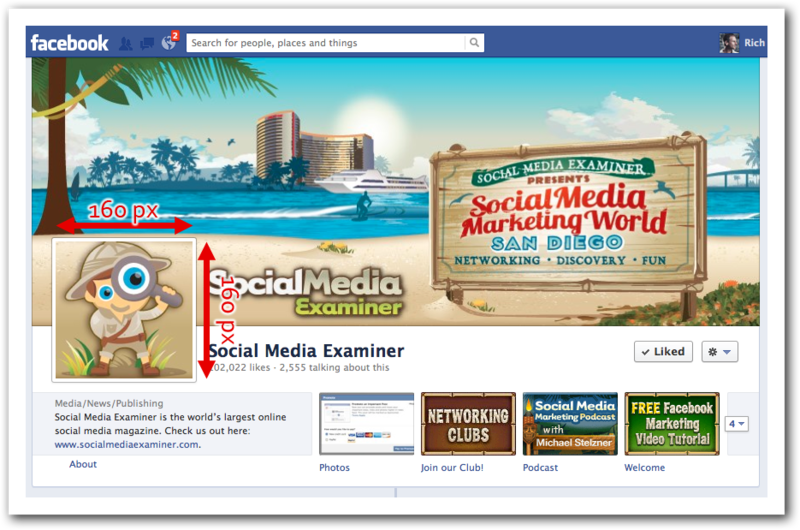 Social Media Examiner does a great job of branding their Facebook page. 6. Get into the newsfeed with EdgeRank. Stats show that only 4% of your fans will ever return to your business page. Pathetic, huh? So how do you stay in front of them? You need to be where they are, and on Facebook it’s all about the newsfeed. However, not all of your updates appear in the newsfeed or get seen by your fans. Why is that? Affinity: How much a person likes your brand, based on recent interactions. The more they interact, the more likely Facebook is to show them more content from you. By the way, likes show some affinity, comments show more, and shares show the most. Weight: How much other people have liked a particular update from you. If a lot of people have engaged with a post, Facebook is more likely to show it to your fans. Decay: The most depressing way ever of saying that after a while it’s no longer news. So, how do you use this information? Create engaging content and post it regularly to your page. 7. Create content that encourages engagement. Currently photos have some of the best engagement of any type of content for most businesses. That’s probably because we’re all so visual and images “pop” in our newsfeed, begging for attention. Asking questions that require a short answer can also increase your engagement. “How do you take your coffee?” or “Describe your perfect vacation in ten words or less,” are good examples. 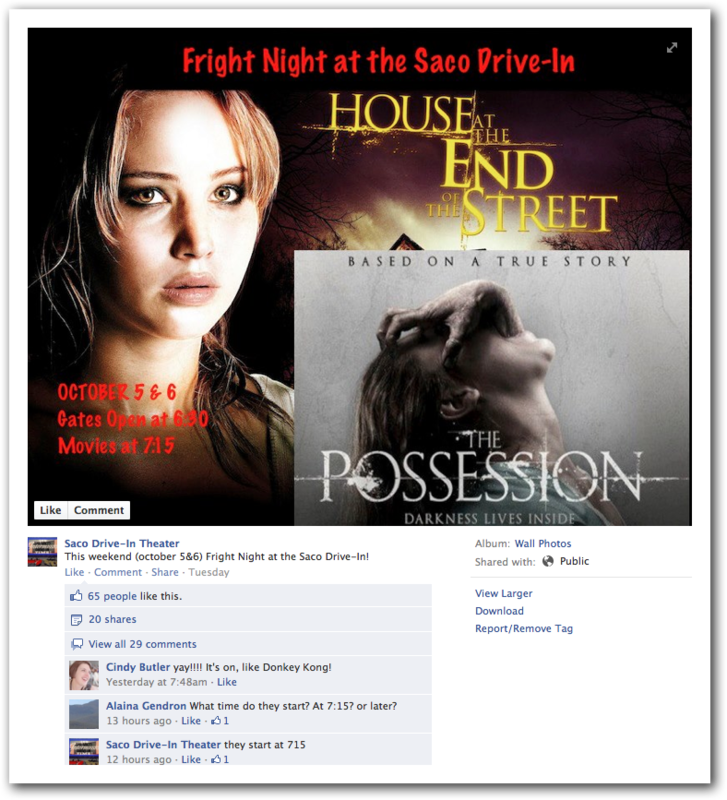 The Saco Drive-In offers frighteningly good engagement. 8. Create and market events on Facebook. From your business page create the event, and then share it with your personal network through invitations. 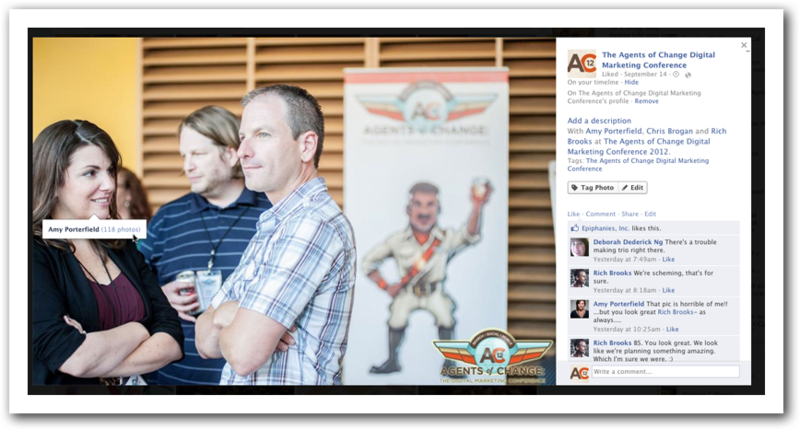 Increase the reach through advertising or asking friends to share the event on their own wall. 9. Use mobile to take your Facebook marketing to a new level. Download the Facebook Pages app for your smart phone. Setup notifications so that your phone gives you an alert whenever anyone interacts with your page. That way you can answer questions or address problems with incredible speed, building loyalty with your fans. But what happens when marketing just isn’t enough to move the needle? Brands just don’t get the engagement they used to on Facebook. To reach a wider audience you’re probably going to need to spend some dollars on ads. The good news is that Facebook offers some amazing targeting options so your ads only appear in front of your ideal customers, and you only pay when they click on them. 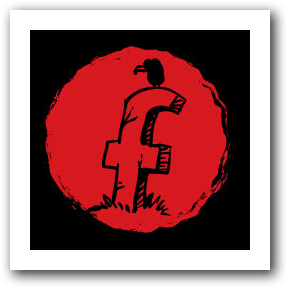 For more information on advertising on Facebook for pennies, check out this great article called Grow Your Facebook Fans Fast, Cheap & Ethically. And for an overview of all the Facebook ad types, read Every Type of Facebook Advertising and How to Use Them. 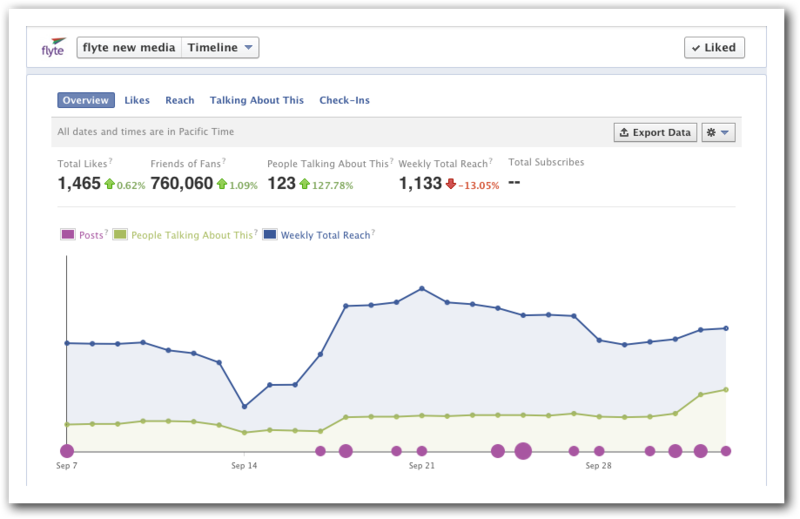 You can’t improve your Facebook marketing without feedback and metrics. Luckily, Facebook Insights provides this information. Reach: How many people saw it. Engaged Users: How many people clicked on your story. Talking About This: How many people liked, commented or shared your story. Virality: A word my spellcheck hates. Also, the percentage of people who saw your story and took action. 12. Remember that Facebook is not an island. Add a Facebook Like button to your blog posts and articles. Make it easy for visitors to share your content with their Facebook network by including a social share button. Use a Like Box on your website or blog. Show how popular your page is and which of your visitors’ Facebook friends are already fans by installing a like box. Visitors can like your page without leaving your site. 13. Prepare for the end of Facebook. No social media platform lives forever. It’s quite possible your business or non-profit will be around years after people stop paying attention to Facebook. You need an escape plan. Here’s what I recommend: use personal networking, marketing and advertising to drive fans and prospects to an email capture page. This can be done on Facebook using a custom tab (at flyte we often use ShortStack to create these type of tabs) or at your own website. You’ll need to create some sort of email bait to encourage signups, but building your list is the most important activity you can undertake at Facebook. Hopefully you found this helpful. If any of these tips were helpful please consider sharing this post with a friend on your favorite social network. We’ve even included sharing buttons to make it as easy as possible for you! Or, if you have a Facebook tip you want to share, let me know by leaving a comment below. This entry was posted in Social Media Marketing and tagged facebook, facebook marketing by Rich Brooks. Bookmark the permalink. Holy Cow! I read this on my iPhone and couldn’t believe how it just kept scrolling and scrolling. This is valuable and juicy enough to be packaged as a formidable ebook. Good stuff Rich. Thanks for all the good tips and rich content. And including the screenshot of your Facebook page showing stellar design, excellent execution of everything discussed in the article, and subtly showcasing the friends/subscriber stats to firmly support your credibility on the topic? Genius! You’re going to need a bigger phone! That’s awesome to hear, and I appreciate you stopping to leave a comment. It means a lot. Wow! That’s so great to hear. It also means I need to send Amy another $20 check. 😉 I appreciate you stopping by and leaving a comment. That means a lot. And if you haven’t yet, please sign up for our email updates and a chance to win a free web marketing & social media consult! Very good information for getting the most out of Facebook. I like the itemized “to-do” list format. It makes a quick read while getting a lot of practical information. I probably would print it out (I know, I know “save a tree”) and take it point by point and check off as I accomplish each item that I’m implementing. I think it’s great you put the dimensions for the images on the header. Most times this type of info is hard to find and a lot of people are not aware that they even need it. Thanks! You can print it out, I won’t tell. 😉 Or, you could “pin” it so it’s always available. In any case, thanks for stopping by and leaving a comment. Glad you got some value out of the article. That’s what I’m looking to do! I also appreciate you sticking around and leaving a comment. Always good to get feedback, whether positive or negative. Great work that is…sure, we can work together to promote my forth-coming Christian book titled LET’S PAULse A LITTLE! Nah, just kidding. Amy’s brilliant when it comes to Facebook and list building. My suggestion would be using the same or similar “email bait” that you’re using at your website to generate signups. I’m just starting to build my social media platform and wow it’s overwhelming. I have some help but right now my head is swimming into all. I’m sure I’ll get comfortable with it all when I start working with it on a daily basis. The information you provided is really helpful! I’m actually working on a post now about how to get the most out of your social media activity in the shortest amount of time possible. If you haven’t yet, sign up for the email updates and you’ll know when it goes live. I see that you have a blog, which is probably the best tool in your toolbox right now. My recommendation is to start narrow and deep, rather than broad and shallow. In other words, find one or two platforms that make the most sense for you (and more importantly, your target audience,) and OWN them. Then, after you can do that with your eyes closed, start to branch out. That’s what I’m doing here. You’ll notice I don’t yet have a Facebook page for TMA, and I’m still tweeting under my established account at @therichbrooks:disqus. I’ll be rolling out more platforms once I can catch my breath. 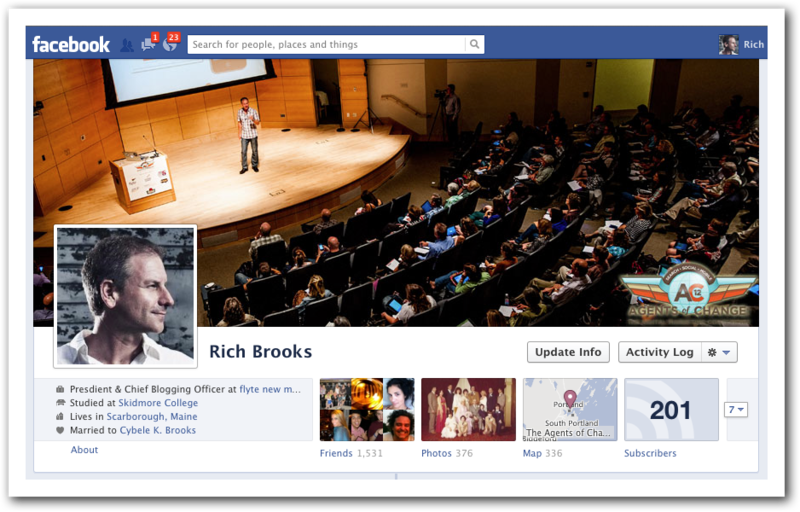 Rich – We’ve got a pretty good relationship with Facebook because of how our software ties in. I haven’t heard from them or any others about custom tabs being revamped. What is your source on that? Thanks! I heard it first at NMX in early January. Apparently they had already rolled out links instead of images in the business page layouts in Australia. Where did you hear this was rolled out on page layouts in Australia? The article you referenced doesn’t mention pages (although FB will likely keep designs of profiles and pages consistent). Regardless, much of FB app strategy is tied to advertising campaigns where people are linked directly to the apps as opposed to clicking through the thumbnail/link on the fan page. Remember very few folks actually come to the fan page. Most engagement is done via the news feed. At the New Media Expo in Vegas in early Jan.
And I agree with you about the newsfeed.